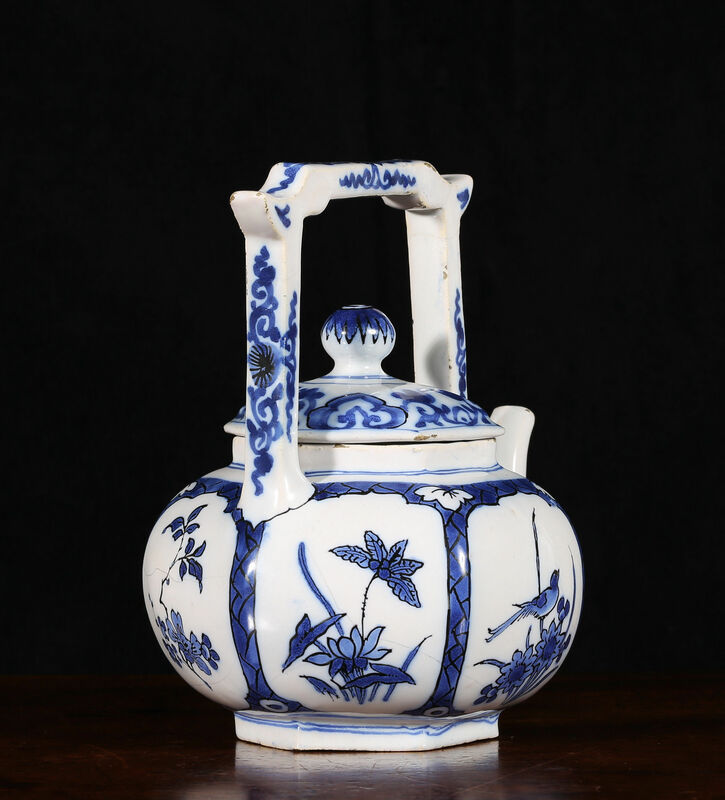 The hexagonal body with high yoke handle decorated in blue with black outlines with panels of flowers after Chinese ‘transitional’ porcelain. The domed cover with globular finial. 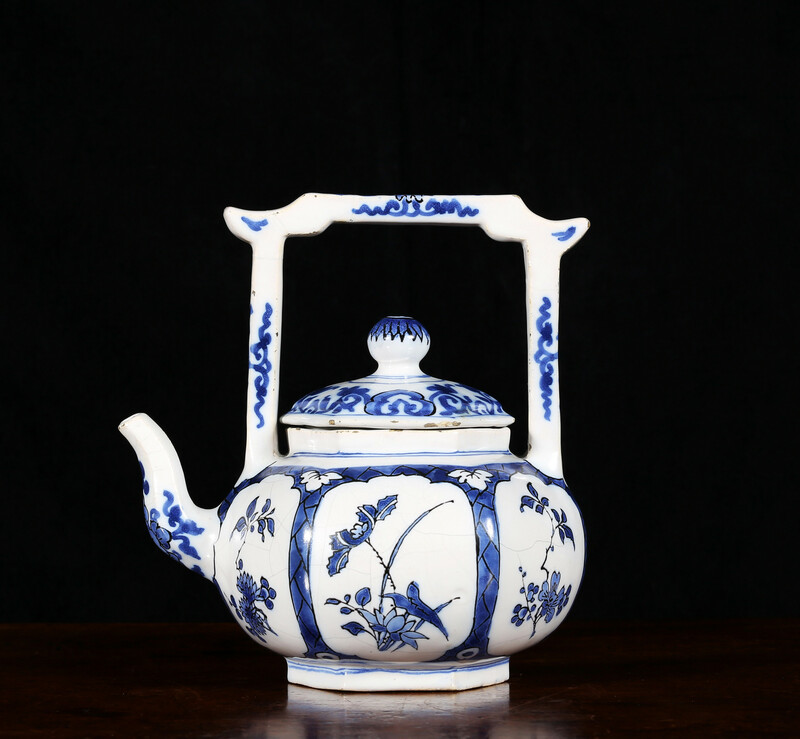 The form is taken from a Chinese Yixing redware teapot. At this period the Het Moriaenshooft factory was run by Jannetge, the widow of Jacob Wemmersz Hoppesteyn (1627-1671), and her son Rochus. 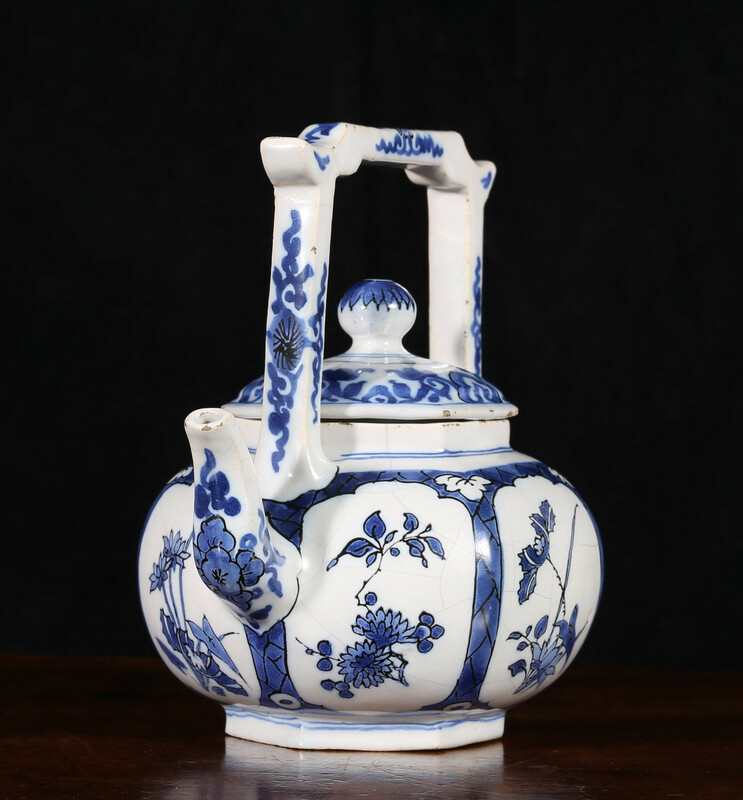 The products of the factory are amongst the rarest and most remarkable of all Delft wares. 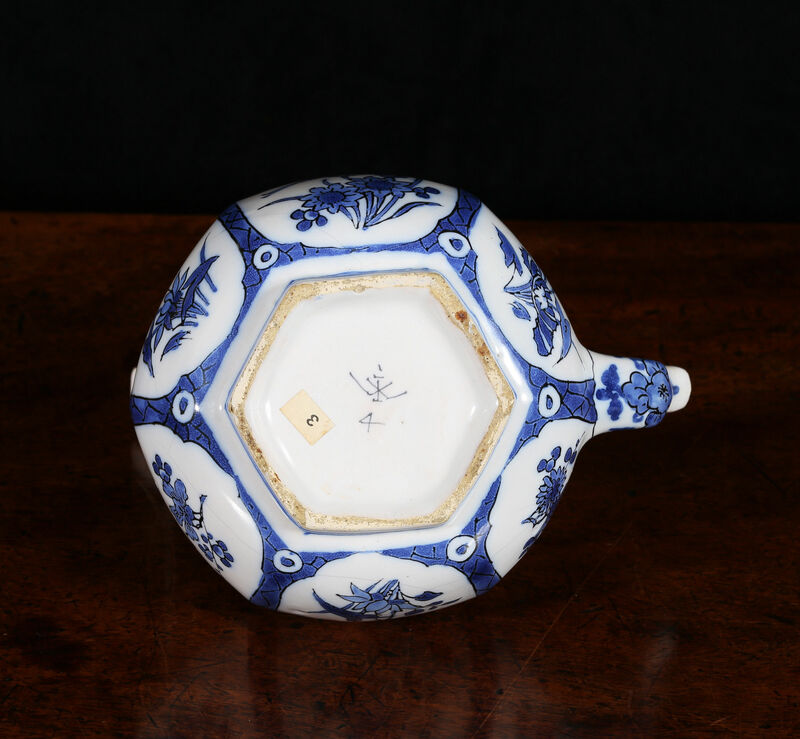 They are characterised by a particularly fine white glaze and soft blue. Under Rochus Hoppesteyn the factory later produced the famous coloured wares in the ‘Mixed technique’ but in spite of their great artistic success they suffered a rapid commercial decline. Perhaps fewer that seventy Hoppesteyn pieces are recorded which bear either the marks of Jacob Wemmersz or Rochus Hoppesteyn. 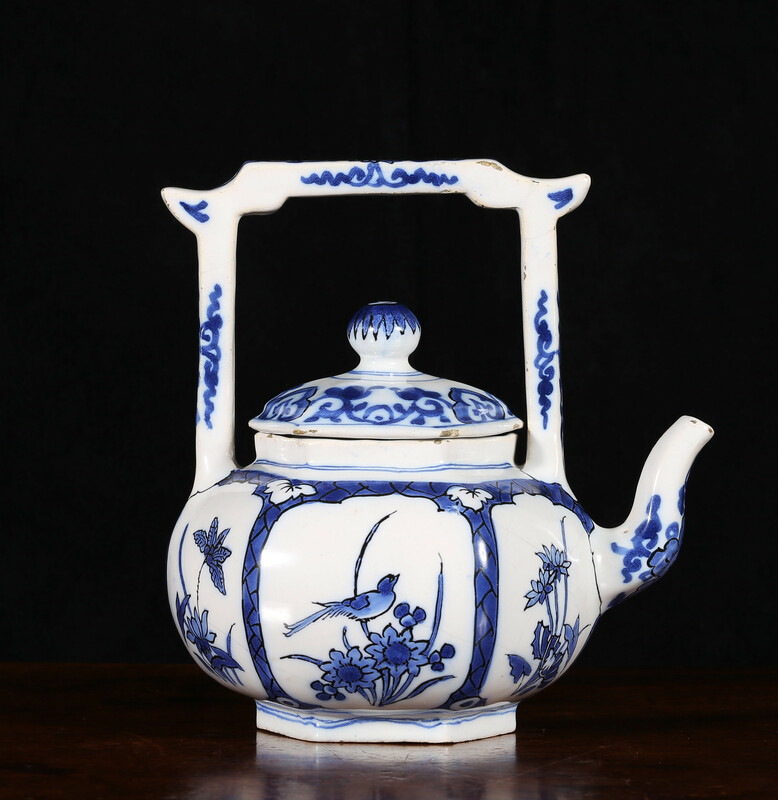 Ours is the only teapot that we have found with the earlier mark. A coloured example of a closely related form is in the Rijksmuseum, Amsterdam, and a remarkable pair are held by the National Trust in the Trevelyan Collection at Wallington, Northumberland which are shortly to be published by Patricia Ferguson in her forthcoming book, Ceramics: 400 Years of British Collecting in 100 Masterpieces. 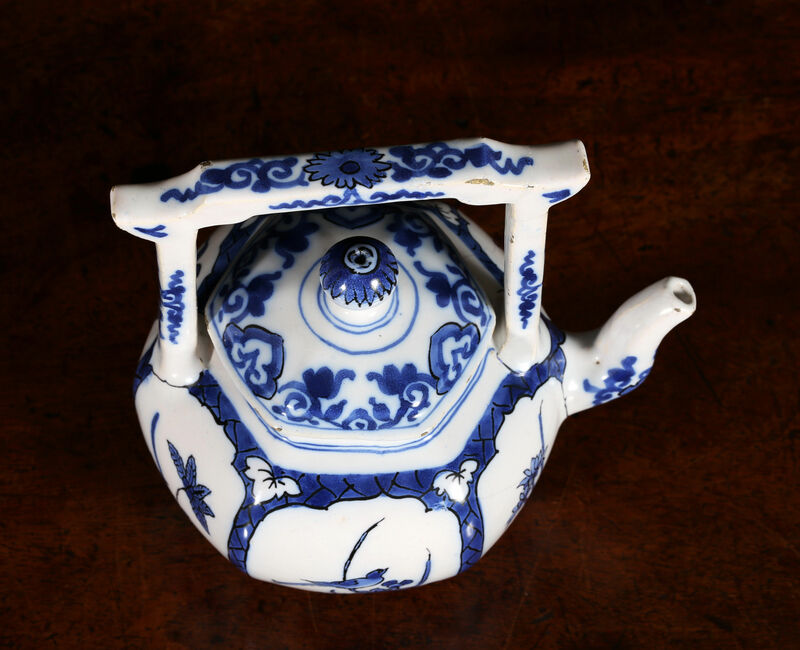 These examples bear the mark of Rochus Hoppesteyn as does a teapot in the Metropolitan Museum of Art, New York, from the gift of R. Thornton Wilson, which does not have the high yoke handle. Condition – The raised yoke handle neatly broken in five places and restuck. No other restoration.